Written by Crutchfield's Dave D.
Got an older dog who can't manage the jump into the back of your van anymore? WeatherTech's PetSTEP makes it easier to bring our four-legged friends along for the ride. 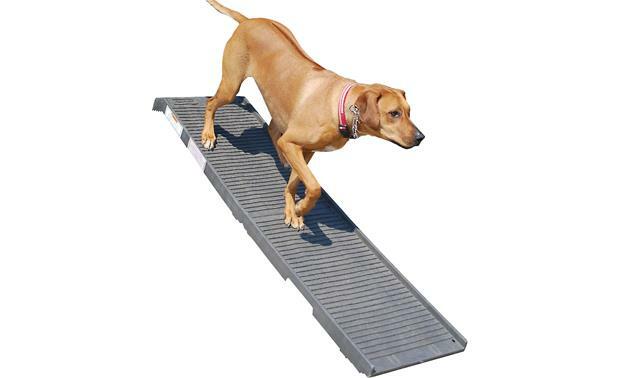 This folding ramp gives your pet better access to SUVs, vans, and other higher-profile vehicles. You can even use it for higher locations at home, like a bed or sofa (if furry friends are allowed, of course). At just over 18 pounds, it's simple to fold up and stow this ramp away in your vehicle or in a closet. It supports animals up to 500 pounds, and the ribbed tread gives those paws plenty of traction. Our price includes shipping.